Colin Kelly Jost (/dʒoʊst/, born June 29, 1982) is an American comedian, actor, and writer. He has been a writer for Saturday Night Live since 2005 and "Weekend Update" co-anchor since 2014. He also served as one of the show's co-head writers from 2012 to 2015, and came back as one of the show's head writers in December 2017. 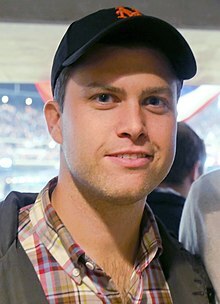 Colin Jost was born and raised in the Grymes Hill neighborhood of Staten Island, New York. He has one brother, Casey Jost, who had a role in Staten Island Summer and is a writer for Impractical Jokers. His mother, Kerry J. Kelly, was the chief medical officer for the New York City Fire Department, and his father, Daniel A. Jost, is a former teacher at Staten Island Technical High School. Jost was raised Roman Catholic. He attended Regis High School in Manhattan, where he was the editor of the school newspaper The Owl, and Harvard University, where he was president of the Harvard Lampoon. While at Harvard, Jost won $5,250 on a college edition of Weakest Link. Shortly after graduating from Harvard, he was hired as a writer at NBC's Saturday Night Live (SNL) in 2005 at 23 years old. From 2009 to 2012, Jost was SNL's writing supervisor. He was co-head writer from 2012 to 2015, and regained that status in late 2017. He often collaborates with fellow SNL co-head writer Rob Klein. During the summer hiatus following the 2012–13 season, executive producer Lorne Michaels asked Jost if he could do the "Weekend Update" feature, as co-anchor Seth Meyers would soon be leaving to host Late Night With Seth Meyers. Jost accepted and replaced Meyers on the March 1, 2014, episode. Jost names Norm Macdonald as a primary influence for his "Update" anchor work, as Macdonald's tone was the one Jost grew up with in high school. He also names Tina Fey as an influence. In addition to Weekend Update, Jost made a brief cameo appearance as Ohio Governor John Kasich in a Republican presidential debate sketch. As a stand-up comedian, Jost has appeared on Late Night With Jimmy Fallon as well as on TBS and HBO. He was selected as a "New Face" at the Montreal Just for Laughs festival in 2009, and has since appeared at the Chicago Just for Laughs festival in 2011 and 2012 and the Montréal festival in 2010 and 2012. Jost has published three "Shouts and Murmurs" pieces in The New Yorker magazine, in addition to writing for The New York Times Magazine, The Huffington Post, The Staten Island Advance and Radar. Jost wrote the screenplay of and played a minor role in the 2015 comedy film Staten Island Summer. He also had a minor role as Paul in the 2016 romcom feature How to Be Single. In late 2018, Jost and Green Bay Packers quarterback Aaron Rodgers appeared in an advertising campaign for Izod. Jost, along with Michael Che, appeared on the March 4, 2019 episode of WWE's Monday Night Raw, where both were announced as special correspondents for WrestleMania 35 on April 7. That same episode, they got involved in a storyline with wrestler Braun Strowman, eventually resulting in both Jost and Che becoming participants in the André the Giant Memorial Battle Royal at WrestleMania. At the event, Jost and Che went under the ring for the majority of the match, and then tried to eliminate Strowman while he was trying to do the same to the Hardy Boyz. Jost attempted to calm the situation by using his therapist, but Strowman chokeslammed him and eliminated the comedians in quick succession, winning the battle royal. His brother Casey Jost is a writer and producer for Impractical Jokers. Jost began a relationship with actress Scarlett Johansson in May 2017. "Explaining your Time Warner bill". Shouts & Murmurs. The New Yorker. 87 (7): 33. April 4, 2011. "A few more bank security questions". Daily Shouts. The New Yorker. July 13, 2012. "Automatic reply". Shouts & Murmurs. The New Yorker. 88 (45): 30. January 28, 2013. ^ a b Mandel, Peter; Baher, Cynthia (May 1983). "The Classes". Brown Alumni Monthly. 83 (8): 58. Retrieved September 13, 2014. Darnel A. Jost and his wife. Dr. Kerry Kelly '77 M.D., of Staten Island, N.Y., report the birth of their first child, Colin Kelly Jost, on June 29. ^ "Colin Jost". TV Guide. Archived from the original on January 29, 2016. ^ Johnson, Ben (October 30, 2008). "Cover Story: Jost for Laughs". AWE. ^ Abramovitch, Seth. "Colin Jost Steps Down as Head Writer at 'Saturday Night Live'". The Hollywood Reporter. Retrieved October 21, 2015. ^ Andreeva, Nellie (12 December 2017). "'Saturday Night Live': Colin Jost & Michael Che Named Co-Head Writers Of NBC Show". ^ a b c d e Fretts, Bruce (April 7, 2014). "Surely You Jost!". TV Guide. p. 9. ^ a b Zaino, Nick A. III (July 25, 2013). "Colin Jost, from Harvard Lampoon to 'SNL'". The Boston Globe. ^ Fox, Jesse David (January 23, 2014). "Meet Colin Jost, SNL's New 'Weekend Update' Co-Anchor". Vulture. Retrieved September 13, 2014. ^ a b "Colin Jost and Michael Che: 25 Things You Don't Know About Us". Retrieved 2016-10-03. ^ "FDNY head medical officer retires in 'Thelma and Louise' style". 16 March 2018. ^ Friedman, Milly (February 24, 2014). " 'Saturday Night Live' moves young comic Colin Jost into a 'Weekend Update' anchor chair". Daily News (New York). ^ Bailey, Rob (March 1, 2014). "Staten Island native Colin Jost to make 'Weekend Update' debut on March 1's 'Saturday Night Live'". silive.com. ^ Ramisetti, Kirthana (January 23, 2014). "Colin Jost to replace Seth Meyers as 'Weekend Update' cohost on 'Saturday Night Live'". Daily News (New York). ^ Robinson, Joanna. "Saturday Night Live Makes Its Most Baffling Move Yet". ^ Gallagher, Brian (March 5, 2010). "Tracy Morgan Set for ID Theft". MovieWeb. ^ Goldberg, Lesley (January 23, 2014). "'SNL' Names New 'Weekend Update' Co-Anchor". The Hollywood Reporter. Retrieved January 23, 2014. ^ "Watch John Kasich Sketches From SNL Played By Colin Jost - NBC.com". NBC. Retrieved 2016-07-02. ^ Cavin, Cory (January 28, 2011). "Check Out Comedian Colin Jost Tonight!". Late Night with Jimmy Fallon. ^ Gadino, Dylan P. (July 16, 2010). "Just For Laughs: Feimster, Lawrence, Jost impress at New Faces". LaughSpin. Archived from the original on April 26, 2013. ^ Jost, Colin (April 4, 2011). "Explaining Your Time Warner Bill". The New Yorker. ^ "Watch Colin Jost dump Alison Brie in 'How to be Single' trailer". ^ Palmieri, Jean E. (September 5, 2018). "Parody Traditional Fashion Ads in New Izod Commercials". Women's Wear Daily. Retrieved September 28, 2018. ^ a b Powell, Jason (March 4, 2019). "3/4 Powell's WWE Raw TV Review: Triple H's response to Batista attacking Ric Flair, Charlotte Flair wants Vince McMahon to name her the Raw Women's Champion, SNL Weekend Update hosts appear, final hype for WWE Fastlane". Pro Wrestling Dot Net. Retrieved March 5, 2019. ^ a b Powell, Jason (March 25, 2019). "3/25 Powell's WWE Raw TV Review: Ronda Rousey, Becky Lynch, and Charlotte Flair face Riott Squad in Beat The Clock Challenge matches, Kurt Angle vs. Samoa Joe, the penultimate edition before WrestleMania 35". Pro Wrestling Dot Net. Retrieved March 26, 2019. ^ Benigno, Anthony (April 7, 2019). "Braun Strowman won the sixth annual Andre the Giant Memorial Battle Royal". WWE. Retrieved April 9, 2019. ^ Sieczkowski, Cavan (2017-12-01). "Introducing ScarJost: Scarlett Johansson And Colin Jost Go Public". Huffington Post. Retrieved 2018-05-20. ^ Kurp, Josh (December 17, 2014). "Colin Jost Was A Contestant On 'The Weakest Link' In 2002". Uproxx. Retrieved March 7, 2019. ^ WWE.com Staff (March 3, 2019). "SNL "Weekend Update" hosts Michael Che & Colin Jost to be special guests on Raw". WWE. ^ "From SNL and YouTube to CBS and CNN: Peabody Awards Handed Out To 36". TVNewser. May 18, 2009. ^ "2014 Writers Guild Awards Winners Announced" (Press release). Writers Guild of America. February 1, 2014. Archived from the original on July 1, 2014. Retrieved August 7, 2014. ^ McNary, Dave (January 6, 2016). "'The Martian,' 'Straight Outta Compton' Land Writers Guild Nominations". Variety. Retrieved January 6, 2016. ^ Petski, Denise. "WGA TV Nominations: 'The Americans', 'Stranger Things', 'Westworld', 'This Is Us' Among Nominees". Deadline Hollywood. Retrieved 7 December 2016. ^ a b Pedersen, Erik (7 December 2017). "WGA Awards: Top TV Noms Include 'Handmaid's Tale', 'Stranger Things', 'The Americans', 'GLOW'". Deadline Hollywood. Retrieved 13 December 2017.